As you can see I’m not real excited for any signficant snow here in the lowest elevations. 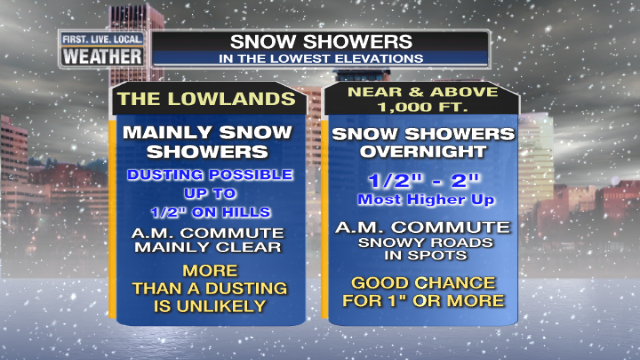 I envision the morning commute as mainly clear, but snowy spots on the side roads up in the hills (close to and above 1,000′). This is a classic “get excited for snow and then the letdown” event. If you’re a kid (or teacher) looking for a snow day, that appears unlikely unless your school is higher up like Skyline, Yacolt, Vernonia, Sandy, or Corbett. Even in those areas, I bet a 2 hour delay is far more likely. Busy evening, that cluster of showers pushed sticking snow all the way down to the Valley floor, a good indication that ANYONE could see a dusting tonight as showers continue streaming inland. I adjusted the forecast above just slightly, but still feel we won’t see widespread accumulations. 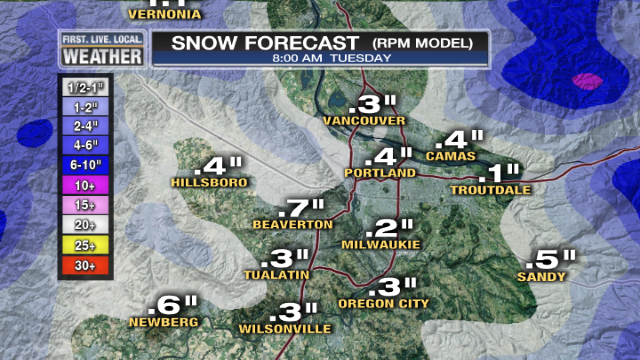 Will PQR (the Portland Forecast Office) see measurable snow? I think it’s unlikely; we’ll see. Official Portland snow accumulation measurements are taken there, near NE Sandy and 122nd in Parkrose. Why don’t I expect more snow than those amounts above? 1. There isn’t a ton of moisture moving inland the next 10 hours. Maybe .20″ at best, which means 1-2″ in the higher hills where everything will stick. 2. Onshore flow is keeping the lowest 1,000′ of the atmosphere above freezing. That won’t change during the night as southwesterly wind continues. Sure, with clearing in between showers your backyard temp could drop as low as 30, but as soon as a shower with its mixing winds moves overhead the temp pops back up to around 35 degrees. Sticking snow is just about guaranteed near/above 1,000′ with the KPTV Tower temps showing the freezing level is right near that level. It’ll stay there the rest of the night before rising a bit tomorrow. I should point out that if we get an unexpected cluster of showers, it could easily stick anywhere. But I see no reason to think that will occur. Tomorrow night looks interesting with steady precipitation spreading inland with the next system. It will likely start as just about all snow, then transition to rain all areas below 1,500′ by daybreak Thursday. I think we could see an inch or two (after midnight) on the higher hills before we change over. We have tomorrow to worry about that though. After that, lots of mountain snow and cold valley rain, but I don’t see us getting near snow again as we head into Christmas Week. That didn’t work out so well last night, the major storm didn’t appear at all. Instead we just had a typical relatively weak windstorm. We definitely over forecast the wind speeds on this storm. The peak gust at PDX was only 48 mph, and the 51 at Troutdale was the only official lowland spot in the metro area that peaked over 50 mph. We didn’t even reach High Wind Warning criteria in the valley. This is quite clear when looking at the PGE outage map; just 7 hours after the peak of the wind there are fewer than 10,000 out of power. During the 2006 storm at this point there were probably still 10 to 20 times that many folks out of power. The following might sound like I’m beating up on forecasters (including myself), but part of the reason I’m posting this is so that NEXT time I can look back and see what’s different. All these blog postings are archived. 1. Timing: Everything seemed to work out as models said with timing, the first surge of wind (which turned out to be the strongest one on the Coast) in the late afternoon. The low moved onshore about on time and about in the right place. 2. Location and intensity of low pressure center: It moved inland just north of Hoquiam. Far enough north to give Seattle stronger wind than Portland, peak gust of 59 mph at Sea-Tac. Central pressure was just under 980 millibars, as models had shown. Maybe slightly weaker than expected depending on which model you had been gunning for. 3. Pressure Gradient: Peaked out at 18.9 millibars EUG-OLM, and 9.9 millibars EUG-PDX. The EUG-PDX value during the 2006 storm was 9.1 millibars, so we slightly exceeded that but with much lighter wind this time around. As we’ve known, but last night makes clear, it’s not just about gradient. In fact many major windstorms (gusts 60+ in metro area) have occurred with WEAKER pressure gradients. Clearly last night we didn’t have upper-level support, wind was likely far too westerly and/or the pressure jump wasn’t as much as we need to get. Wolf Read has an excellent paragraph on this subject in his Storm King summary of the Dec. 2006 storm. Note the paragraph about pressure gradients part way through. 1. Wind Speed Forecast: Way too high in general. I think I said 50-60 mph gusts, or did I even forecast 55-65 mph gusts? Either way, widespread gusts 55-65 mph is far stronger than widespread 40-50 mph, as seen in the power outages. The coast forecast was even worse…see #2. 3. Gorge Wind: This is just a minor point, but I sometimes forget that the west/central Gorge (the part that is oriented SW to NE) often gets a SW wind surge with these types of systems. There was a gust from the SW to 62 mph at Bonneville Dam! Very impressive and unusual, but that has happened in past windstorms too when a low is moving by to the north. You are currently browsing the FOX 12 Weather Blog blog archives for the day Monday, December 17th, 2012.